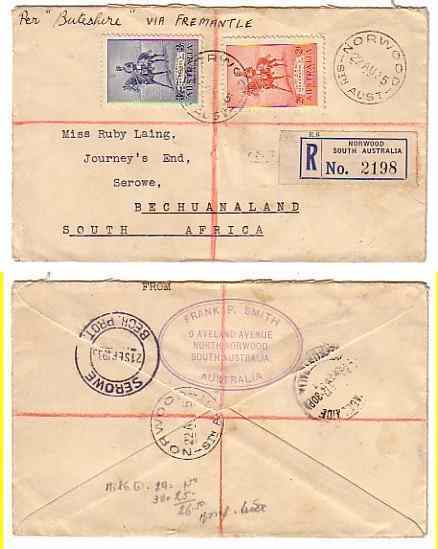 This registered cover was sent from Norwood, South Australia. Norwood is a suburb east of Adelaide. The cover has a neat oval return address handstamp on the reverse. Note the typed FROM at the top of the flap. The sender was Frank P. Smith in North Norwood. There are three Norwood CDS on the cover. and, for a change, a pencilled red rather than blue cross on front and back. The cover received a mostly illegible transit mark in Adelaide. The destination was Serowe in Bechuanaland, South Africa. It arrived there on September 21. Serowe is deep into Africa about 650 km north northwest of Johannesburg. Serowe is in present day Botswana. the port city near Perth on Australia's southwestern coast. The cover would have traveled by rail to Fremantle. In Fremantle it would have been put aboard Buteshire crossing the Indian ocean. In Africa it would have gone overland to Johannesburg and then on to Serowe. of the Clan Lines from South Africa, India, and Australia. 1935 Silver Jubilees issued May 2, 1935 (SG 156 and 157).